Northern Indiana Christmas Tree Farms: choose-and-cut Christmas trees, Tree lots with pre-cut trees, stands, sleigh rides, hay rides and related winter events and fun! Whether you want to cut your own tree, pick a live tree and have it cut for you, buy a tree already cut or buy a living tree you can plant, this page provides detailed listings of Northern Indiana's choose-and-cut Christmas tree farms, places to buy pre-cut (also called pre-harvested and fresh-cut) trees, stands, sleigh rides, hay rides and related winter events and fun. Some listings are for tree farms, others are tree lots, and some only offer hay rides, sleigh rides or other winter events. READ EACH LISTING to know what each facility offers. The farms are listed further down this page, so scroll down the page! Since this service is free and open to ALL Christmas tree farms, not just those who belong to an association or pay for an ad, like almost all other websites do, this is the most complete and current listing available! I'm always looking for more to add, and to correct any inaccuracies or errors, so if you encounter any, please email me ! And please tell the farmer you visit in Northern Indiana that you found their farm here! I need the farmers to realize that you found them here so that they will keep their information up to date! 14602 North County Line Rd, Spencerville, IN 46788. Phone: (260) 341-7330. Email: Mgallaway72@gmail.com. Open: Friday from 9 am to 6 pm Saturday from 9 am to 6 pm, Sunday from 12 pm to 6 pm. Directions: Click here for a map and directions. Payment: Cash, only. Click here for our Facebook page. U-Choose and Cut varieties: Scotch Pine. Living, rooted tree varieties: Blue Spruce, White Pine. 6827 Huguenard Rd, Fort Wayne, IN 46818. Phone: 260-489-5898. Email: joycekoontz@juno.com. Open: See their website. Directions: Huguenard Road between Cook Road and Washington Center Road. Payment: Cash, Check. Limited number of trees. All trees are $35.00 no matter what size. You-Choose and You-Cut varieties: Scotch Pine. 14212 State Road 37, New Haven, IN 46774. Phone: 260-657-5817. Email: mrkurtzenterprise@gmail.com. Open: Monday to Friday, from 4 pm to 7:30 pm; Saturday, from 8 am to 8 pm; Sunday, from 1 pm to 6 pm, The day after Thanksgiving to December 24. Directions: 5 miles east of the Chapel Ridge Shopping center on State Road 37. Click here for a map and directions. Summer Produce: July to August Fall Produce: August to November. Payment: Cash, Check. We offer fall pumpkin tours to school kids in preschool to 3rd grade. PreCut varieties: Balsam Fir, Black Hills Spruce, Blue Spruce, White Fir (Concolor Fir), Douglas Fir, Fraser Fir, Scotch Pine, White Pine. Living, rooted tree varieties: Black Hills Spruce, Colorado Blue Spruce, Norway Spruce. 18832 Amstutz, Auburn, IN 46706. Phone: (260) 627-2618. Email: jealwine101@frontier.com. Directions: 3 mi North of Leo High School on Amstutz. Open: Saturday 8 am to 5 pm, Sunday 10 am to 5 pm. We're told 2012 will be their last season, but they are still listed on the state Christmas tree grower's organization, so call before you go. U-Choose & Cut your own: Scotch Pine, White Pine. 9801 Street Joe Road, Fort Wayne, IN 46835. Phone: 260-486-4336. Open: Daily from the day after Thanksgiving on Sunday through Friday 11 am to 7 pm: Saturday 9 am to 7 pm (except the Friday after Thanksgiving, open at 9 am). Directions: St. Joe Christmas Tree Farm is located on the northeast side of Fort Wayne. Visit our website for detailed directions and a map to our farm. Click here for a map and directions. Payment: Cash, Visa/MasterCard. Precut, U-Choose and Cut your own Christmas Trees. "Train" rides and free hot chocolate and coffee on weekends only. Gift shop. Tree stands. Tree preservative. Removal bags, Wreaths and Swags. White pine roping. Greenery and Boughs. Centerpieces. Complimentary tree shaking and bailing. You-Choose and You-Cut varieties: Blue Spruce, Douglas Fir, Fraser Fir, Scotch Pine, White Pine. PreCut varieties: Blue Spruce, Douglas Fir, Fraser Fir, Scotch Pine, White Pine. 4725 South 400 East, Cutler, IN 46920. Phone: 765-566-2350. Email: mjoyner59@hotmail.com. Open: from Saturday after Thanksgiving; and each weekend until Christmas; Saturday 10 am to 5 pm, and Sunday 1 pm to 5 pm; Possible appointments during the week, call for availabilities. Directions: 3 miles west of Burlington, IN. Click here for a map and directions. Payment: Cash, Check. Click here for our Facebook page. 1011 Trout Creek Rd, Bristol, IN 46507. Phone: (574) 848-1541. Email: ajstrees@cs.com. Open: See their website or call for hours and dates. Directions: S.R. 15 to Division Street turn right onto Trout Creek Road (CR 25), 1/4 mile north on west side. Payment: cash, check, credit Cards. Tree Size: 4'-12'. 14583 SR 120, Bristol, IN 46507. Phone: 574-848-4520. Open: Friday after Thanksgiving - December 24th, 10 am to dark. Directions: 3 mi. E of Bristol IN on SR 120 or 10 mi. E of Elkhart on SR 120. U-Choose & Cut your own: Scotch Pine, White Pine, Douglas Fir, Spruce. 19548 CR 40, Goshen 46526. Phone: 574-533 1440. Directions: 1/2 mile west of SR 15 on CR 40. Open: Saturday before Thanksgiving. Monday to Friday 11 am to 7 pm; Saturday 8 am to 7 pm; Sunday 8 am to 5 pm. Pre-cut: Scotch Pine, White Pine, Douglas Fir, Fraser Fir. Comments from a visitor on October 24, 2011: "Wilfongs in Elkhart Co Indiana no longer does the "u cut" christmas trees. Very sad, we have been going there for over 20 years. Thank you for your website, I have used it several times! " 2497S 925E, Akron, IN 46910. Phone: 574-893-4211. Email: bpotter@pikelumber.com. Directions: 3 mi. West of Akron on SR14, South 1 mi. on CR 925E. . Open: Saturday and Sunday from 9 am to dark. U-Choose & Cut your own: Scotch Pine, White Pine, Douglas Fir, Spruce, Canaan Fir. Phone: 574-223 6332. 311W 375N, Rochester IN 46975. Directions: West of Rochester on 100N 3mi. North on 300W 1 & 1/2mi. Open: Day after Thanksgiving to Christmas Eve. Monday-Friday 3-5:30 pm, Saturday 10 am to 5:30 pm, Sunday from 12 pm to 5:20 pm. 10306n-300w, Huntington, IN 46750. Phone: 260-344-3015. Email: jfields@huntingtonindiana.com. Directions: State Road 114 to Country Road 300 West, turn south on 300W. 1.5 miles. Farm is on right State Road 9 to Country Road 1000 North, Turn West, 2 miles turn right onto county road 300 West, farm is located 1/2 mile north. And for a map to our farm, click here. Open: Saturday and Sunday 10 am to 5:30 pm, week days by appointment. Open Saturday following Thanksgiving from 10 am to 5:30 pm, Tag early available starting September 1st, from 8 am to 6 pm. Payment: Cash, Check. You-Choose and You-Cut varieties: Blue Spruce, Colorado Blue Spruce, Douglas Fir, Fraser Fir, Scotch Pine, White Pine. You Choose and We cut varieties: Blue Spruce, Colorado Blue Spruce, Fraser Fir, Scotch Pine, White Pine. 16901 N. 100 West, Wheatfield, IN 46392. Phone: 219-956-3288. Directions: Take I-65 South to 247 Exit. Go East on Road 231 to Hebron. Turn south at stop light. Keep going south through 4-way stop. Stay on 231 until Kankakee River Bridge (7 miles), turn East on 1700 N. Follow signs. Open: from the day after Thanksgiving to December 23, from 8 am to 4 pm, Friday, Saturday and Sunday. Kingma Christmas Tree Farm - UPDATE for 2018: They are permanently close. 224 E 900th S, Rensselaer, IN 47978. Phone: 219-866-3388. Open everyday, no public restrooms, no credit cards. Comments from a visitor on October 05, 2008: "Farm was great! Great prices HUGE carving pumpkins." 3950 S 200 E, Franklin, IN 46131. Phone: (317)508-2276. Email: steve.dehart@risris.com. Open: November 27 then Weekends only; 9:30-Dark. Directions: Take 31 south of Franklin to 252 W, go right on 252 W to 200 E (Airport Rd), go right 1mile to farm on the left. Tree Size: 4'-9' choose & cut, precut trees up to 14'. 3122 W. 1450 N, Wheatfield, IN 46392. Phone: 219-956-4449. Email: jks@dem.ffni.com. Directions: I-65 to IN 2 E, to 231S, to 1600 N; go East to 700 W, go South to 1450 N, go East, 3 3/4 mile on North side of road. Open: Saturday after Thanksgiving - December 22 Daily 8 am to dark; Closed Sunday. A choose and cut operation, although some trees already cut. Will cut trees for customers. Crosses and hearts from trees that cannot be sold. Stands for crosses and hearts are also available. U-Choose & Cut your own: Frazier firs, Scotch, White & Spruce pine. 3670 E State Road 14 W, Claypool, Indiana 46510. Phone: 260-839-2355. Alternate phone: 260-839-2755. Blank's Nursery - Christmas trees-you choose and you cut, Saws & hot drinks provided. Evergreen boughs, outdoor Christmas wreaths and lighted decorations for sale. Christmas tree seedlings and planting equipment also for sale. 0448 E. 500 S., La Porte, IN 46350. Phone: 219-393-5414. Fax: 219-362-4047. Email: blanksnursery@excite.com. Open:Saturday after Thanksgiving thru December 24,Saturday and Sunday, from 12 pm to 4 pm or by Appointment; nursery hours: January 2 thru November 26 by appointment only. Call any time between 9 am to 8:30 pm for an appointment (219) 393-5414. . Directions: From La Porte, IN; Take US 35 south to County Road 500 S, turn left (east); Go about 1/4 mile; Blank's Nursery is on south side of the road (brown & cream building). U-Choose & Cut your own: (retail only) Red pine, White pine, Scotch pine, Norway spruce, Blue spruce, Black Hills spruce, Doublas fir, Canadian hemlock. PreCut: (wholesale only): Douglas Fir, Fraser Fir, Concolor Fir, White Pine, Scotch Pine, Norway Spruce. 9255 North 300 East, Rolling Prairie, IN 46371. Phone: (219) 778-4805. 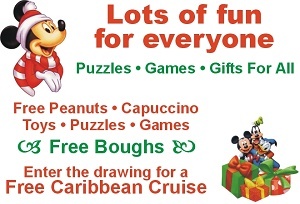 Open 9 am until dark from the day after Thanksgiving through December 22nd; Santa will be on hand from 10 am. to 4 pm. the first three weekends. Free horse-drawn wagon rides 10 a.m. to 3 p.m. also the first three weekends. Many varieties of trees available; plus wreaths, grave blankets, greens and roping. Payment: cash, Credit cards accepted.Dudeck's Pine Country Christmas tree farm has been a family owned and operated business for over 50 years. Our many years of growing quality pine, fir, and spruce have made us the place to go for beautiful Christmas trees, wreaths, grave blankets, greens, roping, and more for hundreds of families each year. You can cut up to 6'-15'.Horse-drawn wagon rides and visits with Santa start Thanksgiving weekend. Every weekend after that they will be there except the last weekend before Christmas. Because our weekends change every year, be sure to check out our Facebook page for updated hours. Please note that hay rides out to the field stop at 4:30pm due to the fact that it becomes too dark to see! We provide bow saws for cut-your trees and tree measurer. Farm insurance prohibits use of chainsaws by non-farm employees. We sell live trees (balled and burlapped). We provide shaking and baling services, free of charge. We also provide drilling for tree stands and sell Rebar and Cinco Stands. In our gift shop we offer an assortment of wreaths, garland, ornaments, and many other decorations, as well as free apple cider and coffee. U-Choose & Cut your own: White Pine, Norway Spruce, Canaan Fir and Frasier Fir. Living, rooted tree varieties: White Pine, Norway Spruce, Canaan Fir and Frasier Fir. 14554 S & 700W, Wanatah, IN 46390-9627. Phone: 219-733-2143. Email: egolf@netnitco.net. Directions: 3 miles east of Highway 421 on US 30, 2-1/2 miles south of US 30 on CR 700W, follow the signs. Open: all year; call for days and hours. Tree Size: 3' - 10'. Warm yourself by the fire and enjoy a complimentary cup of sassafras tea (weekends only). You can watch us shake your tree to get all the old needles out, and then bale it in candystripe netting - both at no extra charge. We provide the saws and a nifty little cart for carrying the tree. The fields are well kept and enjoyable to walk through. 7719 So. Sand Road, Union Mills, IN 46382. Phone: (219) 608-0645. Email: jhglasgow7719@gmail.com. Open: November 27 to December 24; Dawn to Dusk. 14685 South 600 West, Wanatah, IN 46390. Phone: 219-733-9346. Email: info@gusechristmastrees.com. Open: mid November until the Sunday before Christmas (CLOSED THANKSGIVING DAY) 7 days a week 8 am to 4:30 pm, Santa is here several weekends, Activities on weekend, beginning the Friday after Thanksgiving. Directions: Click here for a map and directions. Payment: Cash, Check, Visa/MasterCard. Click here for our Facebook page. We will provide you with a saw and guide you through the tree cutting process! There are sample trees available to help you find the variety of tree best for you. After cutting down your tree we will shake it to get all the old needles out and we can wrap it for easy transport. There are many employees to help with this process and to help you with getting that special tree on your vehicle! Complementary Belgian horse drawn wagon rides.....It is our pleasure to offer wagon rides on the weekends. With a warm cup of grandma's famous hot chocolate your ride is bound to be wonderful! You-Choose and You-Cut varieties: Blue Spruce, Canaan Fir, Colorado Blue Spruce, Douglas Fir, Fraser Fir, Scotch Pine, White Pine. Living, rooted tree varieties: Blue Spruce, Colorado Blue Spruce, Douglas Fir, Fraser Fir, Norway Spruce. 5715 North 750 East, Hamlet, IN. Phone: 574-867-4192. Open 9 am to 6 pm daily from Saturday after Thanksgiving to December 24. Santa and Mrs. Claus arrive in a parade at 9:30 a.m. Nov. 28, and will appear every weekend. Payment: cash, Credit cards accepted. Our picturesque 300 acre tree farm is the backdrop for our holiday festival. Christmas Fest begins the day after Thanksgiving and continues through December 22nd. Come out to Hensler's to cut your own Christmas tree, visit with Santa and Mrs. Claus, stock up on holiday greenery, and warm up in our Eats barn.Ride our tractor-driven tram out to the tree field, Saws are available when you arrive at the field. Select a tree that has been tagged. Tags will include pricing. Hold the saw parallel a few inches above the ground and get to work! Have Hensler Nursery staff shake and bail your tree. 4677 N 525 W, Laporte, IN 46350. Phone: 219-363-7689. Alternate Phone: 219-363-8679. Fax: 219-929-6434. Email: mcclurechristmastrees@gmail.com﻿. Open: 9:30 am to 4 pm on Friday, Saturday and Sunday through the Sunday before Christmas; Week Days by appointment only; see our website for current hours. Directions: 1 1/4 miles off exit 40A on I-94. Corner of 450 N and 525 W in LaPorte County, Indiana. Click here for a map and directions. Payment: Cash, Debit cards, Visa/MasterCardChristmas stands for drilled trees and tree drilling available. We have our Christmas Shoppe in our refurbished turn-of- the-century dairy barn and will be offering FREE POPCORN AND HOT COCOA. We have fresh hand decorated wreaths, kissing balls, pine cone chandeliers, grave decorations, and log reindeer. We also have local artists wares. Christmas ornaments, jewelry,and decorations are also available. We sell Mitchell Yule Stands, the easiest stand to use. Hayrides round the farm and to & from field. Come sit around the bonfire enjoy the afternoon. Click here for our Facebook page. Payment: Cash, Debit cards, Visa/MasterCard, Discover, AmEx. .
You-Choose and You-Cut varieties: Douglas Fir, Fraser Fir, White Fir (Concolor Fir). 12299 S. Long Lane, Hanna, IN 46340. Phone: (219) 797-4745. Directions: From Chicago, I-94E or toll road E to SR 49S to US 30 E. (Fourteen miles to Hanna); 1 and a half mile East of Hanna on US #30, 1 mile North on Long Lane to farm. Open: call for hours. 2788S 425W, Laporte 46350. Phone: 219-362-2832. Directions: Take hwy 39 south from Laporte, rt on Joliet Road, go west through Door Village, 1 mile to 425W, turn south to fourth driveway on right. Open: Day after Thanksgiving to December 24. U-Choose & Cut your own: Scotch Pine, Douglas Fir, Canaan Fir. 4303 Harms Road, Merrillville, IN 46410. Phone: (219) 942-8156. Email: freshtreesLLC@gmail.com. Open: Friday after Thanksgiving until Christmas Eve; Saturday's and Sunday's from 9 am to 4:30 pm. Directions: I65 to US 30 east to Colorado Street. South on Colorado to Harms Road. East on Harms Road to farm. Click here for a map and directions. Payment: Cash, Check. U-Choose and Cut varieties: Blue Spruce, Norway Spruce, Scotch Pine, White Pine. Jansen's Michigan Fruit Market, Inc. - precut Christmas trees. 3622 Rush Place, Hobart, IN 46342. Phone: 219-962-1224. Directions: Click here for di rections . I-80/94 exit Ripley St. south. 2 miles. March through December: 8:30 am to 8 pm. 5705 West 91st Avenue and 5605W 91st, Crown Point, IN 46307. The farm was annexed by the city and is now becoming townhomes. And a water tower. 9380 East 37th Avenue, Hobart, IN 46342. Phone: (219) 962-6738. Email: info@remusfarms.com. Open: Click here for current open hours, days and dates. Directions: Click here for a map and directions. Payment: Cash, Check, Debit cards, Visa/MasterCard, WIC Vouchers. 10 acre garden center. Full service landscaping. Living, rooted tree varieties: Austrian Fir, Austrian Pine, Balsam Fir, Black Hills Spruce, Blue Spruce, Canaan Fir, Colorado Blue Spruce, Douglas Fir, Eastern Red Cedar, Eastern White Pine, Fraser Fir, Leyland Cypress, Norway Spruce, Ponderosa Pine, Red Pine, Scotch Pine, Sequoia Redwood, White Pine, White Spruce, and other varieties (call!). 14118 Peach Road, Plymouth, IN 46563. Phone: 574-936-9262. Email: childsfarm.@centurylink.net. Open: Their website is gone; Does anyone have current information, are they still open? If so, please write me , their last reported hours were December - February - Saturdays and Sundays 1 pm to 4 pm. Directions: Click here for a map and directions. We are registered naturally grown for all crops. Payment: Cash, only. Click here for our Facebook page. 2360 19th Road, Tippecanoe, IN 46570. Phone: 574-498-6524. Email: tkre1@verizon.net. Directions: And for a map to our farm, click here. Open: Thursday and Friday from 1 pm to 7 pm, and Saturday and Sunday from 9 am to 7 pm. open day after thanksgiving till Christmas. Payment: Cash, Check. You-Choose and You-Cut varieties: Balsam Fir, Blue Spruce, Eastern White Pine, Scotch Pine. 95 East 700 North, Valparaiso, IN 46383. Phone: 219-462-1068. Email: holidayforest@aol.com. Open: We are open Monday thru Friday 7 am until 7 pm. Directions: Click here for a map and directions. Payment: Cash, Check, Visa/MasterCard. You-Choose and You-Cut varieties: Fraser Fir, White Pine. PreCut varieties: Fraser Fir, White Pine. Downtown at the Valparaiso Courthouse Square, Valparaiso, IN. Phone: 219-464-8332. Fax: 219- 464-2343. Email: popcorn@popcornfest.org. Open: See their website for current dates and hours. Admission is FREE. Holly Days & Live Nativity is downtown Valparaiso's kick-off to the Christmas Holiday Season! A family-fun event, Holly Days & Live Nativity is filled with the spirit of the season. Come and hear the girl scouts caroling, witness a Live Nativity scene, enjoy a cup of hot cocoa, take a carriage ride around the downtown square, and shop at your favorite downtown stores. And, don't miss Santa Claus riding into town on a fire truck! Schedule of Events: 5:00 pm-Goodie Shack: Shop & have a cup of hot cocoa, 5:15 pm-Carriage Rides Begin. 5:30 pm-Santa Arrives. 5:30-8:00 pm-Toys for Tots. 6:00 pm-Live Nativity Begins. 5715 North 750 East, Hamlet, IN 46532. Phone: 574-867-4192. Fax: 574-867-4960. Email: info@henslernurseryindiana.com. Open: 9 am to 6 pm, Christmas Fest begins: Friday after Thanksgiving. Directions:, 12 miles West of Plymouth, 24 miles East of Valparaiso on US 30, 22 miles South of LaPorte on S.R. 35, then East on US 30, 27 miles West of Bremen. Click here for a map and directions. Payment: Cash, Check, Visa/MasterCard. Santa & Mrs. Claus every weekend. Meet Mrs. Claus, Santa and the live reindeer. Wreaths, garland, kissing balls and other custom made greenery available. Wholesale and retail sales. Great gifts can be found in our Christmas Barn like Fontanini Nativity, ornaments and Christmas decorations! Our picturesque 300 acre tree farm is the backdrop for our holiday festival. Christmas Fest begins the day after Thanksgiving and continues through December 22nd. Come out to Hensler's to cut your own Christmas tree, visit with Santa and Mrs. Claus, stock up on holiday greenery, and warm up in our Eats barn. We provide the saws, all you have to do is find the perfect tree. We specialize in Fraser Fir, Scotch Pine, and White Pine. All are grown under the supervision of our forester with a lot of tender loving care. Don't want to cut a tree? We have a fine selection of freshly cut trees on our lot for you to choose from. 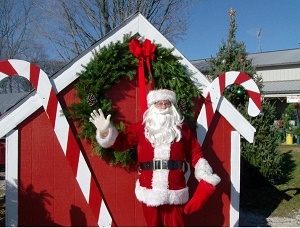 On Saturdays and Sundays during Christmas Fest, Santa & Mrs. Claus open their workshop next to the tree lot. Bring the kids and their Christmas lists so they can experience the tradition of meeting the North Pole's royalty! Cameras are welcome. U-Choose & Cut your own: Scotch Pine, White Pine, Fraser Fir, Canaan Fir. 9562E750N, Walkerton, IN 46574. Phone: 574-586-7970. Fax. 574-586-2677. Email: endofthetrail@eott.net. Winter does not stop the romance. We have a sleigh, for that one horse open ride ( weather permitting... snow!). And give more than a GIFT: give a MEMORY. One Horse Open Sleigh Rides. Re-live childhood memories, or make new memories while singing jungle bells and actually riding in a one horse open sleigh. We have a dark green vis-a-vi or black sleigh to choose from; with or without Santa Claus driving. For bigger groups, we can hitch a team to our bobsled; basically a small hay wagon on runners. Sleigh rides are always a favorite to enhances any winter time party or a "Christms in July" party. Although gluiding thought the snow is more desirable, sleigh rides can be enjoyed even without snow, in a parking lot, or on city streets when the wheels are placed on the runners. Expereince the expressions upon the faces of the children, guests and/or neighbors when Santa Claus' Sleigh come jingle bell-ing to your house or party. Of coarse, it is pulled by a horse while the reindeer are preparing for that big night when they will have to pull for miles upon miles. Our sleighs have been used at many types of parties, such as company, neighborhood, family, birthday and etc..., dances and formals, enagements, anniversaries, as wonderful ride though a neighborhood's parade of lights, to re-live childhood memories and to check off one item from the "bucklist". With a varity of options, we suggest you call with you desires and interest so that we can get it quoted and scheduled. We do everything by appointment. The winter 2015/2016 cost of a sleigh ride at our stable is based on $20 per person with a $60 minium. The base cost to bring the sleigh to your location for use up to two(2) hours is $395. Romantic Carriage Rides : A Romantic Taxi A Romantic Snow Taxi We can help kindle those warm heart fires. Weddings, Proms, Valentine's Day, Mother's Day, and Anniversaries are among the long list of special times that can be enhanced with a horse drawn ride. 5555N St Rd 327, Orland IN 46776. Phone: 260-829-6226. Email: boothfarms@local.net. Directions: South edge of Orland In on St Rd 327. Open: November 26 to December 23, 9 am to dark. 5038 Morehouse Road, West Lafayette, IN 47906. Phone: 765-412-6844. Email: dancassens@frontier.com. Open: from Friday after Thanksgiving on Saturdays from 9 am to 5 pm and Sundays from 12 pm to 5 pm, Monday to Friday from 4 to 6 pm beginning Monday after Thanksgiving through weekend before Christmas.. Click here for current open hours, days and dates. Directions: From West Lafayette: Take highway U.S. 52 West to Morehouse Road. Turn right on Morehouse Road and continue about two miles to the stop sign at the intersection of Morehouse Road, Taft Road and County Road 500 North. Turn left on County Road 500 North and continue to the gate on the right side of the road. Follow the gravel drive to the white barn for parking. Click here for a map and directions. We recycle the trees after Christmas. Payment: Cash, Check. You-Choose and You-Cut varieties: Blue Spruce, Canaan Fir, White Fir (Concolor Fir), Douglas Fir, Eastern White Pine, Fraser Fir, Norway Spruce, Scotch Pine, White Fir (Concolor Fir), White Pine, and other varieties (call!). PreCut varieties: Canaan Fir, White Fir (Concolor Fir), Douglas Fir, Eastern White Pine, Fraser Fir, Scotch Pine, White Fir (Concolor Fir), White Pine, and other varieties (call!). 8816-8832 Old State Road 25 Lafayette, IN 47905. Phone: 765-412-6844. Email: dan@cassenstrees.com. Open: from Friday after Thanksgiving on Saturdays from 9 am to 5 pm and Sundays from 12 pm to 5 pm, through weekend before Christmas.. Click here for current open hours, days and dates. .Directions: Old State Road 25 North between and Delphi. The driveway to the tree farm is located directly across from the Flora road cutoff at County Road 850 South. Turn left into the field and you will see trees near the gate area as well further down the drive along the edge of the field. Click here for a map and directions. We recycle the trees after Christmas. Payment: Cash, Check. At our Old State Road 25 North tree farm, you will find quality trees ranging from 6 to 14 feet tall. Available species include Canaan fir, Fraser fir, White fir, White pine, and a small number of very large Douglas fir trees. We also offer tree baling, trees stands, and tree drilling as described above. We accept cash and checks at our Old State Road 25 North tree farm and there is no barn at this location. We will have some fresh wreaths and garland made from our tree greens. 3549 Prophetstown Trail PO Box 331, Battle Ground, IN 47920. Phone: 765-567-4700. Fax: 7655674736. Email: reservations@prophetstown.org. Open: Saturdays 10 am to 3 pm. Click here for current open hours, days and dates. Directions: Click here for a map and directions. Payment: Cash, Check, Debit cards, Visa/MasterCard, Discover. 7950 Stockwell Road, Lafayette, IN 47909. Phone: 765-523-2170. Email: sgamb@frontiernet.net. Open: Check our website for hours of operation; Typically open the Friday after Thanksgiving through the weekend BEFORE Christmas; Thursday and Friday, 3 pm to 6 pm Saturday 10 am to 6, Sunday 1 pm to 6. Directions: Click here for a map and directions. Payment: Cash, Check. You-Choose and You-Cut varieties: Blue Spruce, White Fir (Concolor Fir), Fraser Fir, Norway Spruce, Scotch Pine, White Fir (Concolor Fir), White Pine. You Choose and We cut varieties: Blue Spruce, White Fir (Concolor Fir), Fraser Fir, Norway Spruce, Scotch Pine, White Fir (Concolor Fir), White Pine. Living, rooted tree varieties: Blue Spruce, White Fir (Concolor Fir), Fraser Fir, Norway Spruce, Scotch Pine, White Fir (Concolor Fir), White Pine. 5216 E. 600 South, Lafayette, IN 47909. Phone: 765-296-2521. Email: xmastrees@mintel.net. Open: Tree sales begin the day after Thanksgiving Day; Saturdays 9 am to dark, Weekdays by appointment; Closed Sundays. Directions: FROM TIPPECANOE MALL: Take U.S. 52 past the light at C.R. 350 South. Take the next right (C.R. 450 East). Go approximately 2 miles to C.R. 600 South and turn left. Go half a mile to the stop sign; continue straight on 600 South. We are approximately a quarter mile past the stop sign on the left. Click here for a map and directions. Click here for current open hours, days and dates. Payment: Cash, Check. You Choose and We cut varieties: Canaan Fir, Fraser Fir, Scotch Pine, White Pine. 7373 Thicket Trail, Lafayette, IN 47905. Phone: 765-426-4095. Email: wilcatwoods@gmail.com. Open: Sunrise to Sunset starting Friday after Thanksgiving;;;Thursday to Sunday. Directions: 3 miles east of Interstate 65 - just off highway 26 at Monitor - follow signs on roadway at Wildcat Creek Middlefork bridge. Roadway curves around yellow house, up hill (blacktop), continue on roadway, past Christmas Trees, turn left and proceed to large barn with green roof- park behind barn in designated areas. Click here for a map and directions. Payment: Cash, Check, Debit cards, Visa/MasterCard, Discover. You-Choose and You-Cut varieties: and other varieties (call!). You Choose and We cut varieties: Black Hills Spruce, Blue Spruce, Canaan Fir, Colorado Blue Spruce, Norway Spruce, White Spruce, and other varieties (call!). PreCut varieties: Black Hills Spruce, Blue Spruce, Colorado Blue Spruce, White Spruce, and other varieties (call!). Living, rooted tree varieties: Blue Spruce, Norway Spruce, White Spruce, and other varieties (call!). 11402 E 700 N, Idaville, IN 47950. Phone: 574-278-7525. Email: cosgraychristmastrees@gmail.com. Open: Nov 21-Dec 23 Closed Thanksgiving; 9 am to 6 pm everyday. Directions: 7 miles north of Monitcello on SR 39 to 700 N., turn east on 700 N, farm is 1/2 miles past 1100 E on right. Payment: Cash, check, Credit Cards. Tree Size: 3'-18'. Click here for a link to our Facebook page.